Pilates and Beyond is without doubt, the best pure Pilates studio and teacher training school in Brisbane, and offers world renowned movement and pure Pilates specialists with over 30 years experience. We have trained elite athletes, Pilates instructors and clients all over the globe, assisting thousands of people in achieving a healthier, functional body, with increased balance, posture, strength and mobility. Our exclusive studio in Paddington, Brisbane is home to a team of expertly trained and certified pure Pilates instructors, who are fully committed to helping you to get the results you want! Pilates is proven to reshape and tone the body without causing stress and imbalance. The movement is rhythmic, fluid and focused to build greater strength, flexibility and endurance. It is layered and structured as a system that requires progressive learning and mastery. 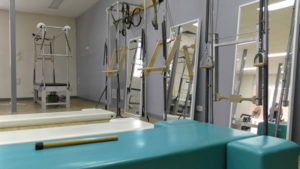 There are various interpretations of Joseph Pilates’ work and some contemporary formats of the method lose sight of the original format and technique. Joseph and his wife Clara originally taught his program informally to his “apprentices” that involved years of observing and practising what Joe did. As the Pilates exercise method increased in popularity, some training programs deviated from the original method. These new methods can be considered “Pilates based exercise”. 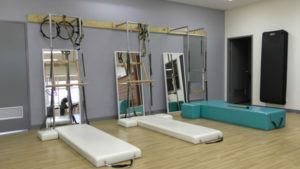 Staying true to the original principles created by Joe, is referred to as teaching Classical or Pure Pilates. This is what we teach at Pilates and Beyond. Teachers must complete a rigorous training program consisting of at least 600 hours of class work, observation and personal practice to become Comprehensively Certified. Continuing education is required to maintain certification. Classes are by appointment only . From 5 am till 7 pm. The following classes are booked out. Please call to inquire about when a space becomes available. Clients who are already doing private sessions can also apply for a more fast paced group class. Please talk to your private instructor for more details on availability. Some mat exercises may be similar to Yoga movements however the principle is different. Very few Yoga styles incorporate the deep core work used in the Pilates method. 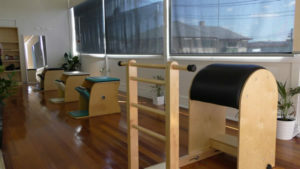 When Pilates exercises are done on the reformer bed with resistance it is very different to yoga. The goal with pure Pilates is to achieve functional fitness. I have a bad back, can I still do Pilates? If you are at all unsure about a muscular skeletal issue or injury, you should consult your physician to help clarify whether or not you are ready to start rehab/studio Pilates or whether you require further treatment. If you have been given the all clear then please mention this to your Pilates instructor so we can tailor a workout specifically for your needs. 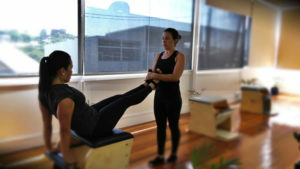 If you are doing 2-3 Pilates classes per week, you should start to see results within 10-12 classes. 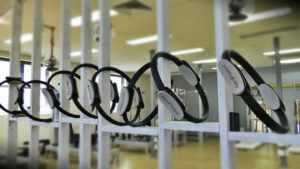 If you participate in other physical activities you will still see results from 1-2 classes per week. Yes. As with any form of exercise, Pilates will definitely help with weight loss. Absolutely! Pilates compliments all other forms of exercise and will help you use your body better no matter which other sports or daily activities you currently do. We highly recommend that you undertake more than one type of exercise. Yes. Pilates is a musculo-skeletal conditioning program. Combining it with cardiovascular exercise (such as walking, running, aerobics, swimming, cyling etc) is a great way of maintaining general fitness. What should I wear to a Pilates classes? We recommend comfortable close-fitting active wear. Pilates instructors focus on correct technique and precision of movement so it is important for them to see the way the body is moving. Socks are essential for the Pilates studio and must be worn due to government health regulations. If you don’t have any then you can buy some from our studio on your first visit. We also recommend that you bring a towel and water bottle. Click here to view our current timetable. To make a booking you can call us directly on 0467 983 691, or click here to make a booking via our online booking form. One of our trained staff will call or email you to confirm your booking. What if there is no class at the time I want? What happens if I need to cancel/reschedule my class? Please call or email us as soon as you know you are unable to attend. Please note that 24hrs notice must be given if you need to cancel or reschedule a class or full fee will be charged. Where can I put my bag and valuables? Your valuables are safe here, just ask when you arrive and we will be happy to show you a safe place to leave your personal belongings. We have experts waiting to talk to you about your specific needs. Call 0467 983 691 Today! Send us an email with your questions and we'll contact you as soon as we can.